Balancing the intangible with the tangible; is that the true value of advice? One of the challenges facing the financial advice profession is how to demonstrate the true value of the work you do for clients. How do you demonstrate the less tangible benefits – how do you talk about value when it relates to peace of mind and reassurance? The real value is delivered over a longer period of time – how do you help people understand this? 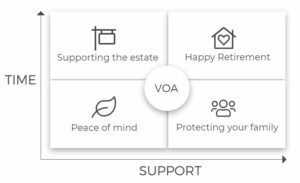 As the founder of EDVOA, I am acutely aware of these challenges and in developing the tools, found myself working through the different value aspects in receiving financial advice. I found the process a really useful way of reminding myself why financial advice is so important and the difference it can make to lives. We all need a reminder from time to time, so I decided to share my thoughts. As financial advisers, we get a clear picture of the client’s future goals and aspirations – we fact find. We combine this with our understanding of your current situation to give us a kicking off point. It sounds easy to set out your future plans but it isn’t. Good advisers can help bring clarity to this area – helping clients to identify, explain, and articulate future life plans and crucially help construct a financial plan to get them there. The advice you get from financial advisers is given over a long period, and will support across a range of life stages, but always with the long term in mind. Even when the client isn’t thinking about their financial circumstances, their financial adviser is advising on the (sometimes small) decisions that need to be made that will have a positive impact in the long term. Knowing someone is there, keeping an eye on the long term financial wellbeing, is reassuring for clients. And of course, there are the questions and decisions that come up in the intervening years that you advise and guide on – helping clients to balance short term needs with long term ambitions. This is where advice makes the difference. Retirement is one of the most complex fields of financial advice. More so since Pensions Freedom have resulted in clients facing an array of options and decisions on income, levels of income, transfers, company pension schemes, annuities, pension drawdown, tax implications…the list is long, and the decisions confusing with long term consequences. Discussing these options with an adviser is essential. One of the most important benefits of advice is for your clients’ loved ones. An adviser who understands the clients’ financial affairs, can be invaluable in helping grieving relatives navigate this area. I have personal experience of this. Following the death of my own father, I met with my financial adviser in my father’s home. They’d been working together for over 20 years. My father was very organised and all his financial affairs were in one place. Even with this level of preparation by my father, there was still about 3 inches of paperwork. Even with my experience in the sector, I eyed it with dread – not knowing where to start. The adviser looked at my brother and me and asked ‘do you want me to take care of that’? I felt a huge sense of relief. He gave both practical and emotional support through the probate process, allowing us to focus on our own grief. Looking back, I realise how valuable his help was at that time. Those were just a few examples of the value financial advisers deliver to clients. They are hard to place a monetary value on – I found exploring them a really valuable process when developing the EDVOA suite of tools. Of course, our tools aim to put a number on the value of advice. We do that by demonstrating the difference in investment growth over a period of time. I believe it’s important to help clients understand this number – but only ever to complement the less tangible benefits. When explaining the value of financial advice to clients, I am a strong believer that the most persuasive argument is a combination of both the intangible benefits and financial value.